pp strapping machine or by hand tool matched with clips. Our pp strapping band packaging way for your reference. 1) with kraft paper covered per roll, pp strap to tighten up. 2) with kraft paper covered per roll, two rolls per unit. 3) with carton box. Other ways of packaging are available. We could decide packaging way according to our customers. You could mix- loading with our PET strap. Posted By: PET Strap Packaging Co.,Ltd. Business Description: PET strap packaging co., ltd., established in 1994, also named STEK strap packaging co., ltd., STEK for short. STEK is the first PET strap manufacturer in China, the only one Innovative High tech Enterprise certified in PET strap manufacturing industry in China and the largest PET strap manufacturer in Asia, owning 6 fully automatic production lines made in Italy, each of which produces 8 straps at one time, outputting 80 tons totally daily. The feature of STEK's PET strap is cracking resistant, splitting resistant, firm welding joint,which is advanced in China. STEK has got certificates of Innovative High Tech Enterprise of Guangdong Province and Private High tech Enterprise of Guangdong Province in 2005. STEK's PET straps got AAR Approval and are widely used both in automatic application and manual application. STEK is the biggest PET strap exporter in China, exporting 40 containers each month worldwide for over 80 countries. Now STEK is in the process of restructuring to be a listed company. STEK's quality management system is ISO9001:2008 certified, environment management system is ISO9001:2004 certified, and the PET strap got SGS approval and AAR approval (Approval No. AAR 67), AAR approval is among the highest standards in the world. Aluminum Corporation of China (second largest aluminum ingot producer of the world), CSG Holding Co., Ltd. (biggest floated glass manufacturer of China), New Zhong Yuan Ceramics and Monalisa Sanitary Ware Co., Ltd. (ceramics manufacturing magnate of China), Nine Dragons Paper (Holdings) Limited (whose market value is the biggest of China paper market)...STEK has been cooperating with more than 60 listed companies. Our engineers work deeply at the sites of the end users, investigate the requirement of the application, therefore to research and develop PET strap of high quality, and participate in customers' application and improvement, approaching manufacturing and applications matched furthest. Cooperating with strapping machine producers, developed a full range of matched PET strapping machines and packaging consumables, our 30 professional engineers have been working deeply at end users' sites, therefore to offer service from packaging designing, installation, commissioning and training to after sales service, assure customers of using PET strap and machines without trouble. Made in Italy, each producing 8 straps at the same time, low production cost and stable quality. The founders' family have been dealing in PET industry for the past 27 years, and they are the pioneers in polyester polymer field. In the past dozen of years they have firstly researched and developed Far Infrared Thermal Fiber, Quallofil, Bottle to Bottle Recycling, Nano Anti Sars Mask PET field. 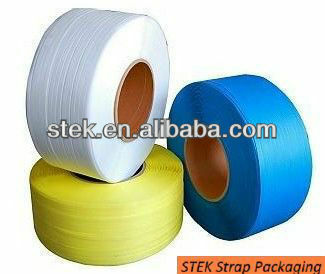 In 2008 STEK s PET strap was approved as Nano Modified, Composite Co extruding High Tensile Strength PET Strap by Science & Technology Centre of Guangdong Province for High tech Achievement Authentication.. STEK has invested a great amount of funds in establishing PET Technology Engineering Centre of Foshan, which has got many patents of polymer foundation inventions. Our company established in 1994, is a professional PET Strapping manufacturer and exporter. We give customers considerate and one stop service by providing strapping, strapping machines and related consumables together. We got ISO9001 and ISO14001 certificate, and got AAR certificate from USA. Our factory has an area of over 40,000 square meters and has 4 buildings. We can produce 8 straps in one production line at the same time and each production line can produce 15 tons of PET strapping per day. We produce both machine grade and hand grade strapping. The feature of our PET strap is cracking resistant, splitting resistant, firm welding joint. We sincerely invite the interested customers to visit us.